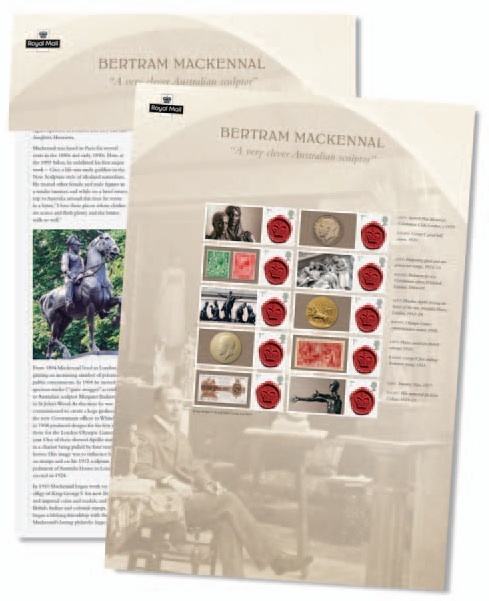 This year marks the 150th Anniversary of the birth of Sir Edgar Bertram Mackennal, KCVO, the Australian sculptor famous for designing the stamps and coinage bearing the likeness of King George V. A Commemorative Sheet to be issued on 19 September 2013 explores his life and work. Royal Mail product codes are shown below but these are not yet available to order on Royal Mail's website and probably not by telephone either. 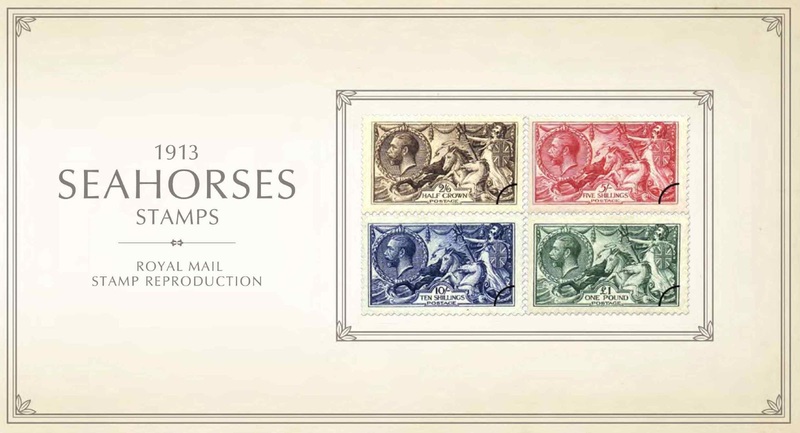 I suppose there should be some available at Stampex as that is when they are being issued. 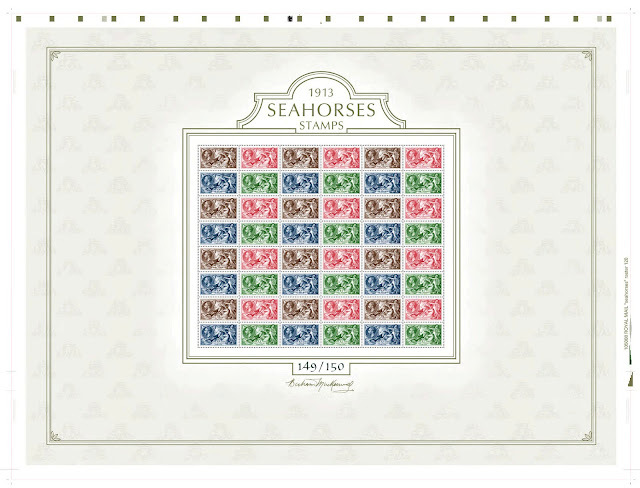 Also on sale (not at most Post Offices) will be a Seahorses Facsimile Pack (at £8.95) and a press sheet of the facsimile sheet at £59.95. Neither of these products is postally valid. Question is, will the £1 seahorse be a facsimile of a stamp that actually existed, or like the Kings Stamps commemorative will it have the design of the re-engraved seahorses? Question is why is RM continually moving away from issuing stamps that can be used for normal postage - these are NOT stamps but Cinderella material. Sorry? 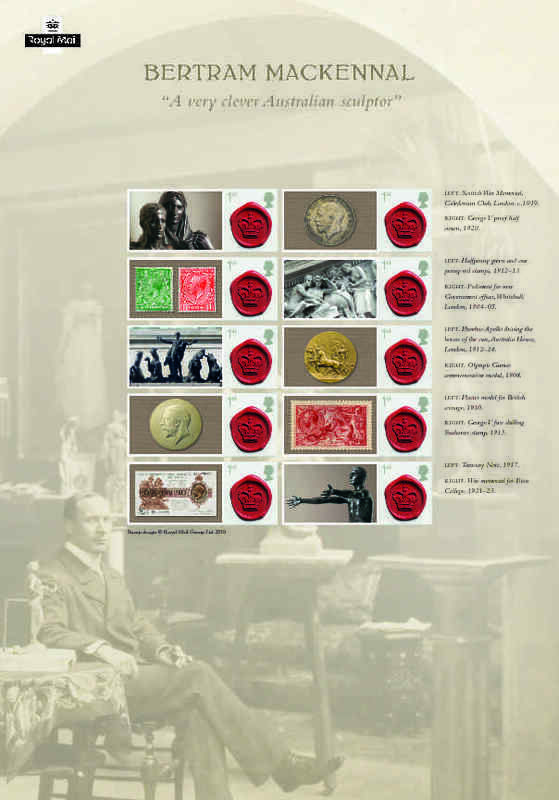 "why is RM continually moving away from issuing stamps"
This year, up to the Butterflies, there will be 62 stamps of 1st or 2nd class, and 10 of higher face values, plus 5 miniature sheets some of which contain only 1st & 2nd class stamps. By the end of the year that number will rise to 88 and 20 with 7 MS. This are part of a series of replicas that started in 2010 with the £1 PUC and they make a very good substitute for the real thing. But nobody has your arm up your back while the other hand yanks out your wallet to pay for them!! True of course - but this still dilutes the purpose and integrity of a Postal Authority. Ian, I thought the first in the series of Royal Mail replica stamp packs was the Penny Black block of four issued in May 2000. Do you not count this in the same series? Paul, you'll be right, although I don't think that is in the series. OK, but there was also an Olympic Games replica pack of the 1948 stamps issued in 2012. Yes, that's the 2012 pack: because it was photogravure and not engraved I had forgotten it! This pack has the RM product code ZP004 indicating that it is the 4th. Since you put the codes for the Facsimile pack and sheet I have tried to put an order in for these items but Royal Mail keeps telling me to ring back in August. I would imagine by then the Sheets will already be allocated to some lucky few. Why when you can place standing orders for most of it's products won't it take advance orders for these items, I realize they can't send them until they are released but not to take orders once the codes are out there seems pointless and just alienates it's already frustrated customer base. Re availability, I did suggest that that might be the case - red paragraph at the top. I don't think the Press sheet (the only one in short supply) is being sent to people with Press Sheet standing orders as this are not postally valid stamps. I have a copy of the mackennal seahorses press sheet no. 88 of 150, what is it worth? I know of no market for press sheets. I know of some people who have bought them, but most people have decided that storage and preservation is a problem that they don't want, and have shunned them.